Gotten too many interviews lately? Or not enough? It's easy to cancel your listing with us if you're ready to leave. BUT - if you're looking for more interviews, how about trying our "BUMP" service first? You might not be getting interview requests because many other listings have posted above yours on our site since yours first appeared. By now that means that your profile is far down in the listings, and it has not been sent out in an email in long time either. So, before you cancel, try BUMPING up your profile! A BUMP order will re-post your profile at the top of ALL your categories, and include you in our next email blast, too! Reminding our audience of your availability for interviews like this is key to getting more interviews! You already paid for the set-up of your profile and the link has been widely shared online (which helps improve your site's search engine ranking (SEO)). Don't give all that up - try a BUMP instead - all for one low fee here. Want Even More Promotion? Upgrades can get your Guest Expert Profile seen! Get details on how our upgrades can help you get more publicity here. It's easy. Please just visit your Paypal account to cancel the recurring billing agreement there. Look for the transactions billed to "RADIOGUESTLIST.COM" or "***RadioGues". Note that your profile is connected to your billing agreement. Once you cancel the billing agreement your profile will then be removed. No partial month credits or refunds. However, we do recommend that you keep your Interview Guests Directory listing live as long as possible to help you attract more interview bookings and improve your own web site's SEO search engine optimization! So, a quick "BUMP" is a better idea if you are still looking for publicity! Try a BUMP here now! Other questions or concerns? 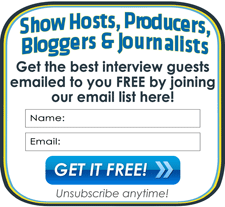 Email us at cs @ interviewguestsdirectory.com any time. Thanks for supporting our service!